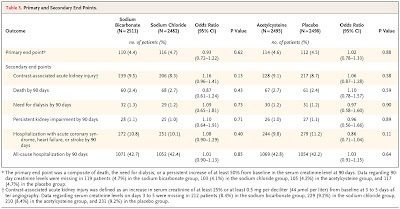 The PRESERVE Trial, which was recently published in the NEJM was a large study of a variety of preventive measures for contrast-induced nephropathy. It used a 2x2 factorial design to test the efficacy of NaHCO3 vs. normal saline and n-acetylcysteine vs placebo for the prevention of CIN. The trial was stopped early as there were no signals that any of the treatments were better than any other suggesting that the best treatment for CIN right now is likely the use of both saline and the smallest possible quantity of low-osmolar contrast. The overall decline in the rates of CIN over the last few years are likely more related to the change in the way that contrast is used rather than any special benefit that we were imparting using novel measures to prevent CIN. The trial was enriched to try and increase the rate of AKI - it included patients with an eGFR between 15 and 45 (non-diabetic) increasing to 60 in diabetics. The overall mean eGFR was 50 so perhaps there were not quite enough patients with advanced disease but given that more than 5000 patients were included in the study, it is hard to really draw the conclusion that it was underpowered for subgroups. Patients with AKI were also understandably excluded and it is unclear what the risk is in this subgroup of patients. The other thing that was really interesting about this study was the outcome used. Traditionally, studies on CIN have used AKI as the outcome. This being defined typically as some change in creatinine in either absolute or percentage terms. The current AKIN definition of stage I AKI is a 0.3mg/dl increase. This study used an increase of 0.5mg/dl. AKI of this magnitude has been shown in large studies to be associated with adverse outcomes including increased length of hospitalization and mortality but there is always a lingering question about how clinically significant it is in the long run when it tends to resolve in most patients. Because of these concerns, there has been a recent move towards using MAKE (major adverse kidney events) as a composite outcomes in trials of kidney disease. This concept, stolen somewhat from the cardiology literature is thought to be more meaningful as it results in real, long-term harm to patients. In this study, the authors chose MAKE90 - a composite of death, need for dialysis and permament 50% increase in creatinine at 90 days as the outcome. Overall, approximately 9% of patients had AKI following contrast administration and about 4.5% had a MAKE90 event (2.5% died, 1.5% required dialysis and 1% had a permanent decline in renal function). Another thing I would take away from this study is that we should not let people tell us that CIN does not exist (which I have heard around the halls more often than I like over the last year or so). The next session of GlomCon's Nephropathology Essentials will be held this Tuesday, June 12th at 11 am EDT. 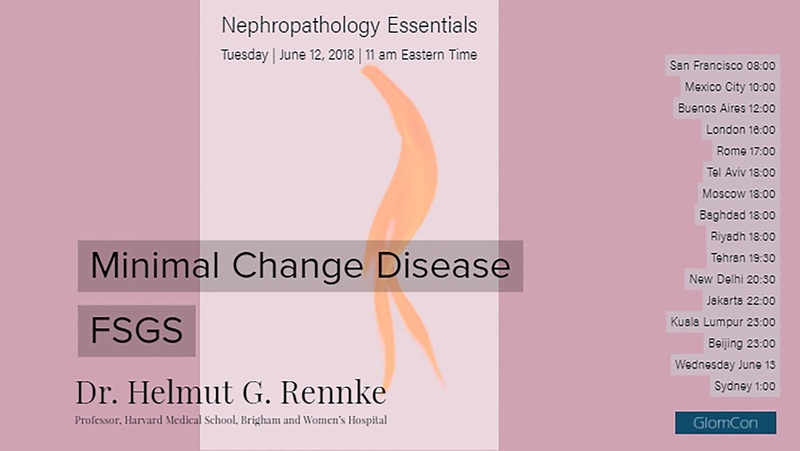 Dr. Helmut Rennke will be leading the session which will focus on Minimal Change Disease and FSGS (see below for session details). MCD was also covered in this past GlomCon session. For further on both MCS and FSGS pathology, make sure to join the session on Tuesday. One of the things that I always highlight when teaching fellows and residents is the importance of appropriate drug dosing for patients on dialysis and one of the drugs that is most often inappropriately dosed in my experience is gabapentin. Today, an article in JASN highlights again the importance of not overusing this drug in the dialysis population. 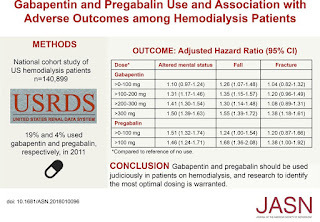 Gabapentin and pregabalin are often used in patients with CKD primarily to treat neuropathic pain and restless leg syndrome and given the high prevalence of diabetes in this population, the proportion who receive these drugs is very high. In patients with normal renal function, the maximum dose of gabapentin is 3600mg daily in divided doses. However, gabapentin is renally cleared and so the dose needs to be adjusted according to the GFR. For patients on dialysis, the recommended dose is 100-300mg post dialysis on dialysis days only. However, this is routinely exceeded in clinical practice. 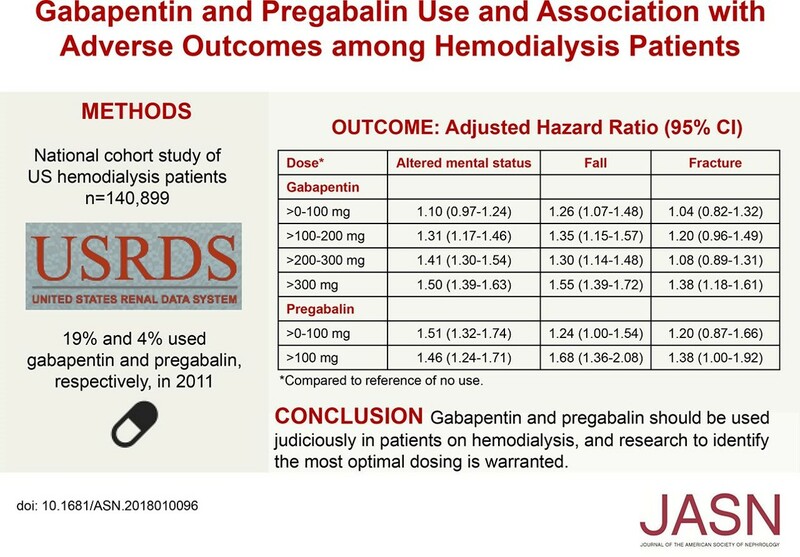 The study in JASN looked at medicare prescriptions for gabapentin and pregabalin in dialysis patients examined the relationship between the doses used and a variety of outcomes including altered mental status, falls and fractures. 20% of the dialysis population received at least one prescription for these drugs in 2011. Even at the lowest doses (less than 300mg daily), there was an association between the use of these drugs and AMS and falls while doses greater than 300mg daily were associated with a 40% increase in the risk of fracture. Similar results were found for the higher doses of pregabalin. Of course, this was an observational study and there may have been unmeasured confounders that may have biased the results but the authors did account for other medications that can increase the risk of falls. 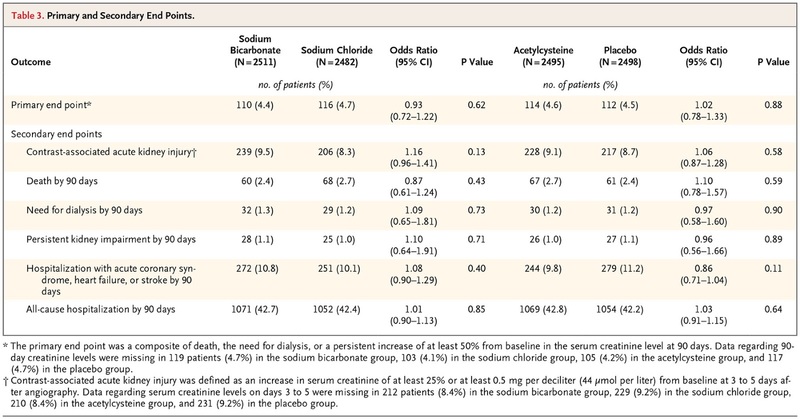 Overall, this should serve as a reminder to the community that we need to more carefully police the dosing of medications in our dialysis population, particularly when they are admitted to hospital. The goal of the GlomCon Teaching Platform is to enable Nephrologists, Nephropathologists, and trainees in Medicine, Nephrology, and Pathology to connect with each other to 1) Discuss challenging cases, 2) Share clinical experiences and 3) Obtain the expertise of participating faculty and invited speakers. Access to this resource is completely free! Going forward, every Tuesday (same time weekly, 11am EDT) there will be a case-based conference, fellow's interactive conference, or renal pathology seminar. 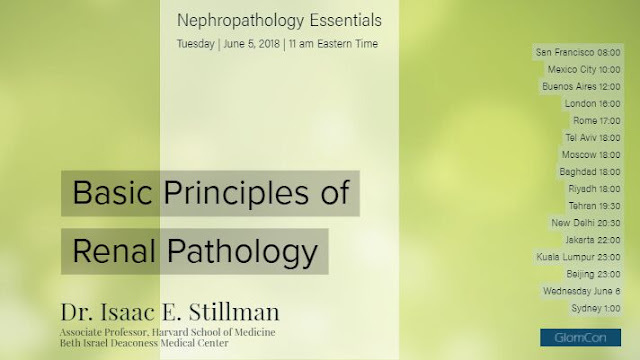 You are invited to the inaugural session of GlomCon Nephropathology Essentials on Tuesday, June 5th at 11 am EDT. The first session will be led by Dr. Isaac E. Stillman and will focus on the basic principles of renal pathology.